I have made the “super size” version of this so I already knew it would be good. And it was; the sauce tastes authentic (as far as I know) and is sweet without being cloying. 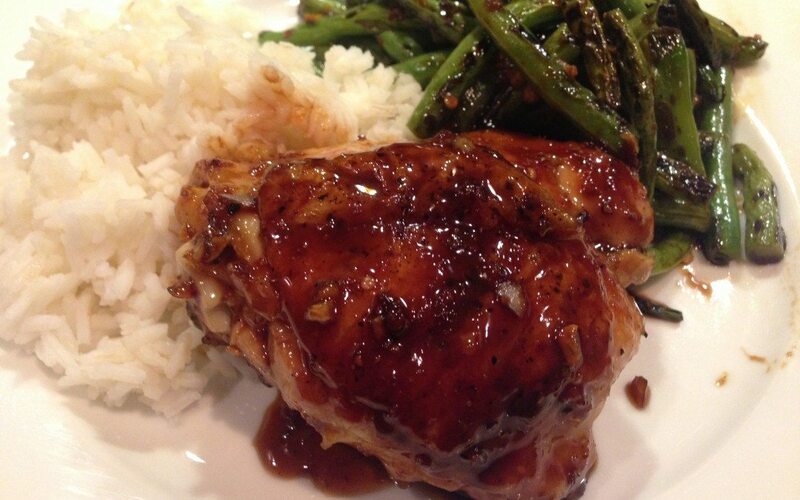 Using chicken thighs ensures that you will not dry them out. I can see the predicament this recipe put the authors in however. Four chicken thighs is a bit too much for two people and yet two (one each) seems stingy and three is just weird. So eat two and save two. Or one of you can eat two, one of you can eat one, and you can save one. Or you, all by yourself can eat four. Or…well, you get it. You are going to cook the thighs skin side down at first and you’re going to need to weigh them down. A second pan (covered in foil so the chicken doesn’t stick and clean up is easier) does the trick and you can weigh it down with a couple of cans of beans or soup or a brick or The Goldfinch, doesn’t matter. Flip and continue to cook on the second side. Remove and make a very simple sauce in the same pan. Done. I served this with steamed rice and one of my favorite green bean dishes from Cook’s Illustrated, Spicy Stir-Fried Green Beans and Scallions.